Scotland isn’t full up. If you are as appalled as we are at the path this Westminster government is taking, come and join us. Come here to live, work, invest or study. Come to Scotland and be part of building a modern, progressive, outward-looking, compassionate country. I think this was a wonderful thing to say. Firstly, it’s true, and secondly, it shows the world that Scottish nationalism (or sovereigntism or independentism as I prefer to call it) isn’t racist in the slightest, but progressive and open to the world. If the rUK continues moving towards a hard Brexit, and Scotland as a consequence votes for independence within Nicola’s window of late 2018 to early 2019 to escape the madhouse, I find it quite likely that many people from the rUK (both natives and EU citizens desperate to remain within the Internal Market), will take up the offer to join us in Scotland. They’ll be joined by many companies that need to remain within the EU and reckon the move to Scotland is easier than moving to a place outside the old UK. As a consequence, Scotland’s population might grow rapidly soon, perhaps by 10% in less than a decade. That’s great in a lot of ways, but where do we house them? The Central Belt is already busy and congested, and although I’m sure there’ll be space for a few more, I think a more radical solution will be needed. At the same time, the Highland Clearances were a horrible and dark part of Scottish history, and it would be nice to right the wrong by reversing them in some way. So I’m thinking we should start planning for a few new towns and cities in the Highlands. In some cases, existing towns can be expanded a bit, but sometimes it’d be good to think big. For instance, I was looking at a map, and I thought Durness would be a nice candidate for expansion: It’s a beautiful place, there isn’t any large town in the vicinity, and from a historical point of view, it was the location of the Durness Riots of 1846 (when the women of Ceann na Beinne area defied the Sheriff’s Officer sent to deliver the summons of eviction as part of the Clearances). If we built a new town there the size of Milton Keynes (population 230k), the Highland council area would double in size, practically overnight (the current population of the whole area is 230k, too). A new town could be built in a modern way, incorporating the area’s stunning nature as green areas, and building modern infrastructure such as trams at the same time as everything else. The houses should be built to environmentally friendly standards, and of course every house should have ultra-fast Internet as standard. The city should also be designed to be carbon-neutral from day one. There has been a lot of talk about English universities setting up campuses abroad to maintain a presence within the EU, and Durness could become the best location for them, because their campuses could be designed and built at the same time as the rest of the city. Given that Durness is almost as close to Reykjavík as it is to London (1050km vs 900km as the crow flies), it could also easily become a very attractive location for American companies needed a foothold in the EU if it had its own airport. Some people would perhaps say that Durness would be a ridiculously northern location, but of course it’s further south than both Oslo and Stockholm. 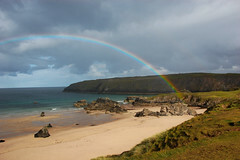 If done right, the City of Durness could become one of the most attractive places to live in Scotland, and a real magnet for people moving to Scotland after independence. Independence changes everything. We need to think big. ← Oh, so you won’t allow it, Theresa? Great blog and a great post! I too have been thinking about the idea of repopulating the Highlands in an independent Scotland , so I agree it was definitely a pleasant surprise and a very positive thing to hear Nicola Sturgeon’s welcoming words towards people from other countries. I totally agree with you that any new settlement should be as eco-friendly, non-invasive and harmonious with the unique and special landscape as possible. I also agree that the whole area needs superfast broadband as standard as well as other infastructure improvements. Also local energy and other projects should be at least partly community owned and not controlled by greedy multinational companies. As a Highlander myself, I grew up near Inverness but went on camping holidays on the North West coast every year… It’s very, very remote, a wild, beautiful landscape with infinite lochans and rocks piled upon rocks, the beaches are talc-white and phenomenal , the air is incredibley soft to breathe and there’s a magical atmosphere which can’t be expalained, it just has to be experienced… Literally unlike anywhere else in the British Isles. To me it feels like a sacred landscape. Why not do that? Expand all the existing settlements in the Highlands by a manageable amount. Do it by building eco-villages around the outskirts of each… try and preserve and enhance the existing village centres as the focal point – ie. don’t go building any more giant Tescos on the outskirts which inevitably destroys the heart of the community – just look at Dingwall for a sad example of that. If you want a big town on the North Coast, why not take Thurso which already has a population of about 8000 and start growing it up to about the current size of Inverness (50,000 approx). It already has the North Highland College which could be expanded, given University status and a new campus, etc. But more than anything, Thurso is geographically in an important spot… The ferry to the Orkneys is there. Surely boosting the infastructure and economy of Thurso would be good for Orkney too? To get back to airports… Planes are so last century, such a backwards way to travel! In my opinion a progressive, forward looking Scotland needs to be at the cutting edge of new technology… as part of the coming new Scottish enlightenment. With this in mind, surely we should be looking at future transport solutions like Hyperloop. It runs on electricity, so can be powered by renewables, it goes as fast as a plane without all the hassle and excessive wastefulness associated with airports. It’s frictionless and works inside a (almost) vacumn, so it’s vastly more economical than existing rail, and it’s also a lot cheaper than current high-speed rail solutions such as HS2. It could even be built above existing roads to prevent damaging the countryside, or even better (but more expensive) underground. I see this as a possible answer to connect the whole of Scotland in order to open up the whole country for business and investment. A team from Edinburgh University has already been working on hyperloop proposals for Edinburgh-Glasgow and Edinburgh-London routes…. but I’m thinking Thurso-Inverness-Aberdeen-Dundee-Perth-Stirling-Glasgow-Edinburgh… one big snake covering the whole country. In fact, eventually why not even take it under the sea from Thurso up to Kirwall and even Lerwick? … and another branch could go from Inverness up through Skye and eventually under the sea to Stornaway. It may sound crazy, but I’ve visted the Faroe Islands where every remote outlying island is connected with a modern tunnel with a fast road – the result is that these places are totally remote in location but not remote at all in terms of the short time it takes to get to the capital Torshavn…. so it’s possible to live and work anywhere on the Faroes, and so it should be in Scotland. I have lived in London for 20 years because I can’t do my type of work at the level I want in the Highlands…. but with an ultra modern transport system I could, easily. Prototypes are already being tested… I bet it’s up and running and commercially available before HS2! Anyway, I know we are getting ahead of ourselves… first we have to become an independent country, then we have to start voting for these sort of things to happen and so much more, but I think I’ve already said too much! p.s. Great name for the blog… whilst George Bush and Tony Blair came up with the term “Axis of Evil” to justify their dispicable acts and to spread fear and negativity, at the other end of the human spectrum Alex Salmond used the term “Arc of Prosperity” to foster hope and positivity! … sorry I didn’t mean to pour cold water on your big, completely new town idea – I do like that idea too, but just don’t put it right on top of a beautiful tourist spot. How about on one of the vast moors a few miles inland from the North Coast? Milton Keynes was built on unremarkable flat farmland, not on the site of a picturesque Cornish seaside village. The people who live there are perfectly content without the beach (I know, I’ve lived there). They have a giant indoor ski centre, man-made lakes for sailing and waterskiing, cycle paths everywhere passing through copious green spaces and woods, always avoiding the roads, etc, etc. Even a bleak Highland moor could be transformed by planting trees. If they managed it in Auroville in India where they planted 3 million trees in the desert and raised the water table making a lush and habitable environment, then surely we can do it in Scotland too! Or perhaps the colony could be founded with some sort of public subscription. Wealthy aristocrats and merchants across Scotland could donate… what would be a good name for such an enterprise? What about “the Durness scheme”? And thus, even before a new Scottish state has got going, we have already come across the potential seed for a new Union. As an Islander, I can’t begin to tell you how arrogant and offensive I find this. Typical urbanite mentality, tell the peasants what is good for them, and to hell with whether they want it or not. No clue about the H&I region and absolutely no care. These areas are not playgrounds, nor are they dumping grounds, we have our own culture and lifestyle and it would appear that that doesn’t matter to you…when has it ever, though. This is an appalling idea and has gone down like a lead balloon to those whom I have shown it, all of us from within the areas mentioned. We need jobs and infrastructure to enable us to remain, we need our young to be able to remain, if they so wish, and to be able to come home after being away. Nobody seems to care about this, so many things are neglected and taken away from us all the time. Housing has become a huge problem, thanks to the second home brigade. When a potential solution to the housing problem was presented to Kevin Stewart, he more or less blew his nose on the paper it was written on. There is no housing problem according to him. As is that of SNH, they constantly stymie any development, including housing. They have their fingers all over everything they can…to stop it. As far as they are concerned they know best, we don’t, and nothing, I feel, would give them greater pleasure than to see the whole area deserted and devoid of human beings. Turned into one giant “wilderness” for them to manage and pat themselves on the back for creating. The very ones who have created, cherished and nurtured the landscapes they are supposedly so concerned about are nothing to people like them…we just get in the way of the view. We don’t need ruddy great towns dumped on top of fragile areas. The people who have the solutions for the “problems” in H&I region are those who live there, but nobody ever asks us. And even if we shouted it from the rooftops, nobody ever wants to listen, because their entire attitude towards us is patronising and the oh, look at those quaint /annoying crofters, what are they up to now, is very prevalent. Angry? You bet I am. This is not what I voted Yes for.